If Japan, a point clear at the top of Group B above Saudi Arabia and Australia, wins then it does not need any points from a tricky trip to Saudi Arabia in the final group game. 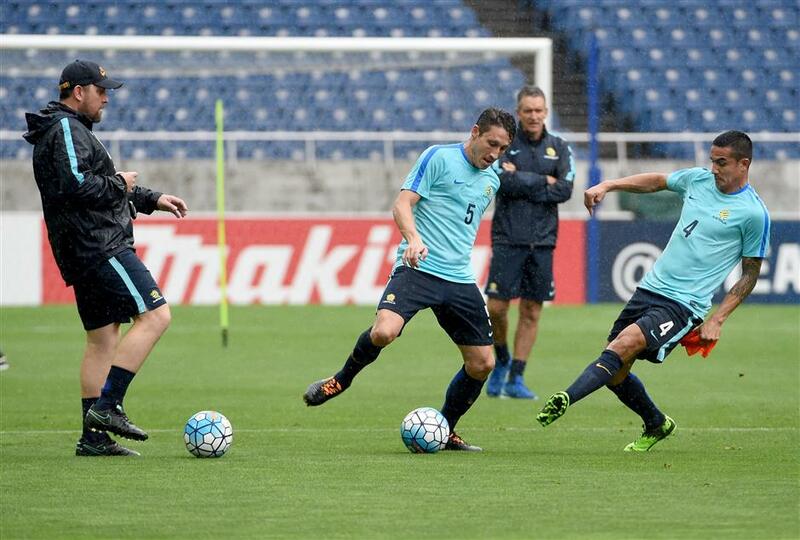 Australia coach Ange Postecoglou (left) looks at midfielder Mark Milligan (center) and forward Tim Cahill during a training session at Saitama Stadium in Saitama, Japan, on August 30, 2017, on the eve of the team's 2018 World Cup qualifier against Japan. A win for either Japan or Australia when they meet at Saitama, north of Tokyo, on Thursday means a place at the 2018 World Cup, with both teams keen to seal their spot with a game to spare. If Japan, a point clear at the top of Group B above Saudi Arabia and Australia, wins then it does not need any points from a tricky trip to Saudi Arabia in the final group game on September 5. Despite sitting on top, the pressure has been building on Japan coach Vahid Halilhodzic after a series of uncertain performances. Just last week the national association denied reports that the Bosnian would be dismissed if the hosts fail to defeat Australia. "I hear the recent criticism directed my way and it puts pressure on me but this is the kind of situation I like," Halilhodzic said. "The more I come under attack and the more criticism I face, the more determined I am to respond." Japan is concerned over the fitness of Inter Milan fullback Yuto Nagatomo, but will otherwise be at full strength. Both Japan and Australia received a boost on Tuesday when Saudi Arabia missed a chance to go top of the group and lost 1-2 away to the United Arab Emirates. That result means the Socceroos are able to qualify for Russia if they manage to win in Japan. A draw would leave the team needing to defeat group struggler Thailand in Melbourne next week to be sure of a fourth successive World Cup appearance. Australia coach Ange Postecoglou denies that there is any pressure. "From the outside people look at it and see pressure, but for anyone involved, be it a coach or a player, you look forward to these occasions," Postecoglou said. In Group A, the only matter to be settled is whether South Korea or Uzbekistan takes the second remaining qualification spot after Iran sealed the first in June. Under former Real Madrid coach Carlos Queiroz, Iran is not only unbeaten in eight group games so far, but has yet to concede a goal. South Korea, aiming for a ninth successive World Cup appearance, has lost its last four games to Iran and a 2-3 defeat to Qatar in June was a third defeat in four qualifiers. It cost Uli Stielike his job as head coach, with the German being replaced by Shin Tae-yong. Shin has called up English Premier League stars Son Heung-min of Tottenham Hotspur and Swansea City's Ki Sung-yeung, although both have been recovering from injury. Son, who played 70 minutes for Tottenham in Sunday's 1-1 draw with Burnley in London, declared himself fit but Shin declined to be drawn on whether the English-based players will start the game. "It wouldn't be appropriate for some players if I said I have chosen starting members at this point because that implies I've already made up my mind even before they came here," Shin said. "People will find out about our starting members on the match day." Uzbekistan can keep the pressure on South Korea with a win over last-place China in Wuhan, central Hubei Province. If the former Soviet republic can do so and then defeats South Korea in Tashkent on September 5, then the Central Asians will qualify for a first-ever World Cup.